UPDATED, March 10, 2011 — Armando Alacantara will be released, according to Catholic Cardinal Jaime Ortega. 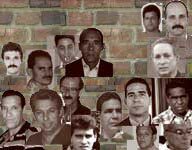 Cuban political prisoner Armando Alcántara Clavijo insists that his jailers respect his human rights. Alcántara, an activist with the Pedro Luis Boitel Political Prisoners organization, insists that he be given the special medical diet prescribed by the prison doctors, and he insists that he not be forced to wear the uniform of a common prisoner. He also insists he not be forced to participate in prison activities designed to tout the glories of the government. He insists that be treated like a man. In turn, the Castro dictatorship insists that Alcántara be treated like an animal. The regime's jailers at the Las Mangas prison in Granma province have since July 3 held Alcántara in a punishment cell known affectionately as the "black hole," according to a dispatch from independent journalist Tania Maceda Guerra posted at Payo Libre. There is no mattress, so Alcántara sleeps on the hard floor, and because he insists on being treated as a political prisoner and not wearing the uniform of the killers, robbers and other common criminals Alcántara spends his time wearing nothing but his underwear. UPDATED, Jan. 7, 2010 — Alcántara is facing trumped-up charges of assaulting a prison guard.